Two astronauts switched their spacesuits to battery power this morning at 6:22 a.m. EST aboard the International Space Station to begin a spacewalk planned to last about six-and-a-half hours. 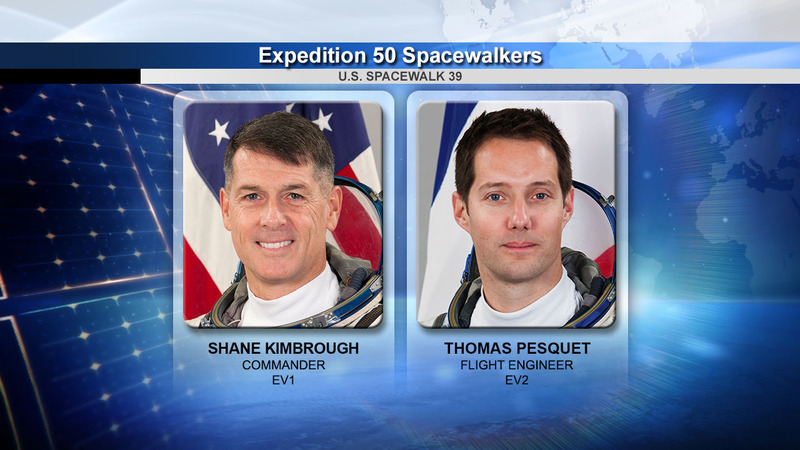 Expedition 50 Commander Shane Kimbrough and Flight Engineer Thomas Pesquet of ESA (European Space Agency) will install adapter plates and hook up electrical connections for the remaining three of six new lithium-ion batteries installed on the station’s starboard truss. Kimbrough is designated extravehicular crew member 1 (EV 1), wearing the suit bearing red stripes. Pesquet is designated extravehicular crew member 2 (EV 2), wearing the suit with no stripes. The new channel lithium-ion batteries installed Friday, Jan. 6 during the first spacewalk with Kimbrough and Flight Engineer Peggy Whitson of NASA are functioning properly and all electrical loads are being routed normally to systems through that power channel. Earlier this week, the robotic ground controllers used the Canadian-built “Dextre” Special Purpose Dexterous Manipulator to move the three new lithium-ion batteries for today’s spacewalk into their slots in the Integrated Electronics Assembly. Engineers also moved one of the old nickel-hydrogen battery onto the HTV External Pallet for disposal and two others to one of Dextre’s arms for temporary stowage. In all, nine old nickel-hydrogen batteries will be stowed on the external pallet for disposal when the HTV is deorbited to burn up in the Earth’s atmosphere later this month. The power channel for the last of the new batteries will be activated during the spacewalk after adapter plates are moved into place on the Integrated Electronics Assembly. Watch the spacewalk on NASA TV and on the agency’s website. Follow @space_station on Twitter for updates online. Learn more about the International Space Station online, including additional information about the current crew members.